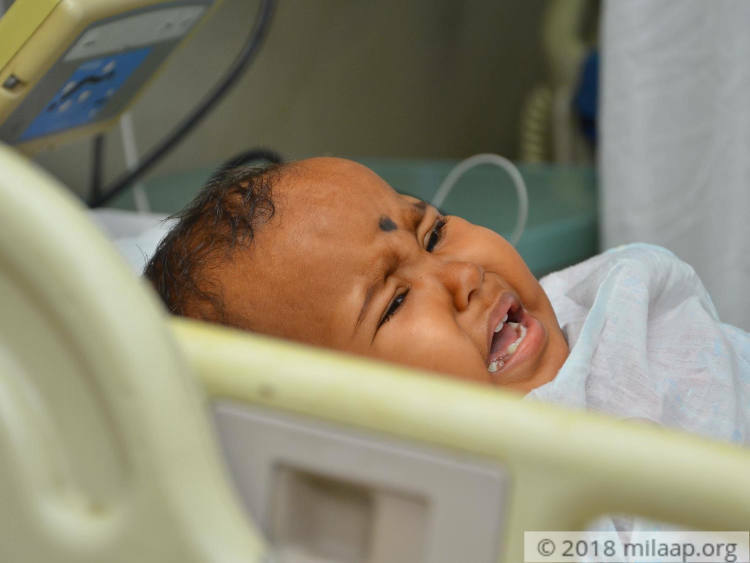 "She is scared of injections and cries uncontrollably. Two days back, she got violent seizures. They lasted for almost 10 minutes; I stood shell-shocked and my wife fainted at the sight. For a moment I thought, I may not see our baby again. She can't even express her pain, she is just a baby, it is terrible." - Kavin Kumar, Father of 1-year-old Dharshika. 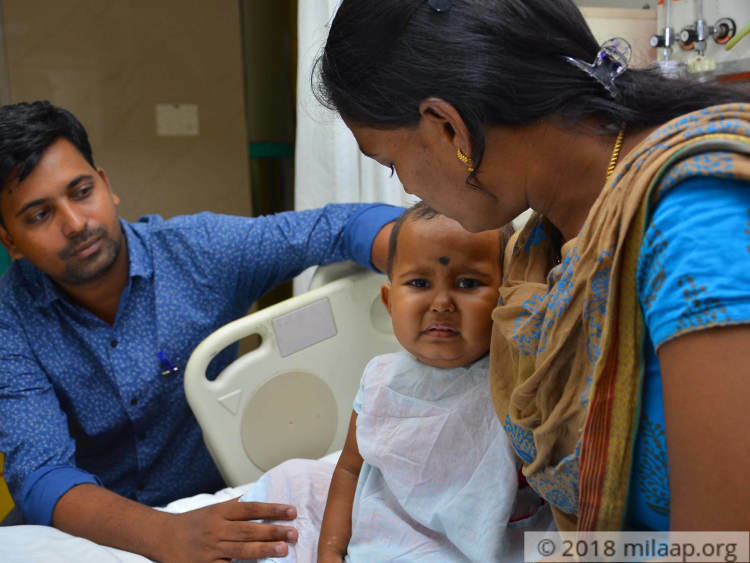 1-year-old Dharkshika is the only child of Kavin Kumar and Ramya. She was the apple of their eyes and she was perfectly healthy until a few months ago. Now she is diagnosed with Acute Cell Lymphoblastic, a dreadful cancer that occurs when bone marrow cells develop errors in its DNA. Her parents had a lot of dreams about her future - she has hardly seen the world but now fighting for her life. This little baby has a painful journey ahead of her. "We had just started giving her solid foods when her stomach started swelling. Doctors said it was indigestion. She had medicines and syrups but the swelling continued to grow. She started throwing up and refused to even have milk. Shivers ran down my spine when she began bleeding profusely from her gums. When the doctors said 'cancer' I was shattered completely." - Ramya, Mother. Dharshika had undergone 2 chemotherapies till now and needs it for next 3 years to recover completely. Her blood counts are checked frequently. Missing one cycle of chemo can turn fatal for this little baby. 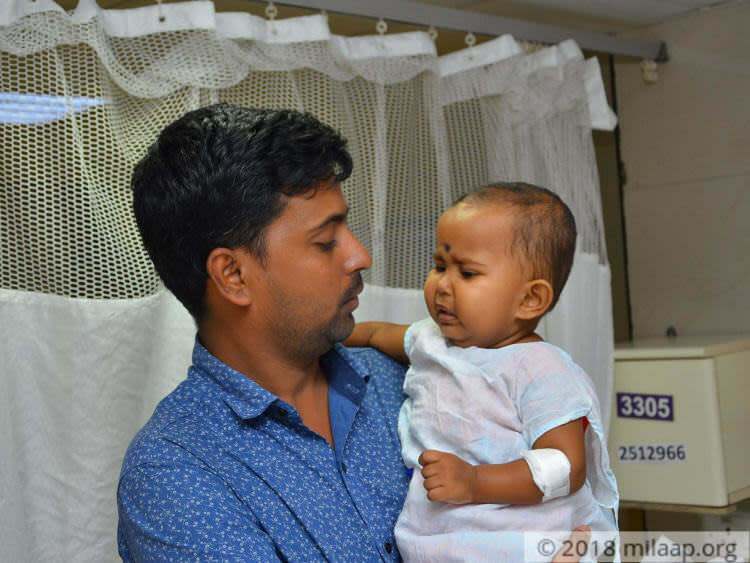 "Her little body is now poked with needles everywhere and the injections are unbearable for her. She is given medicines to control the bleeding. I can't bear that she has to go through so much of pain at this young age." - Ramya. Kavin Kumar works in a private company and earns a meager amount with which he managed to feed his family. 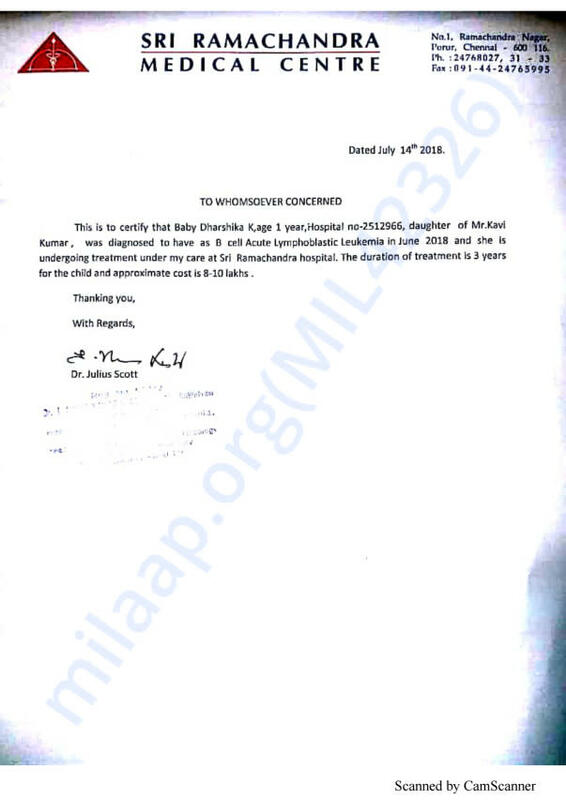 When the baby was in ICU after the violent seizures, he spent 8 lakhs for the treatment. Each chemo costs Rs 20,000. It has become hard to find veins in her tiny body so she needs a chemo port through which she can get chemo, IV fluids and blood transfusions. The chemo port costs Rs 1 lakh and the father cannot afford it let alone the treatment itself.
" I have spent everything I had, I borrowed from my friends and family. She has just started the treatment and I'm already neck-deep in debt. I don't know how I can manage for the next 3 years. Doctors say that she has a good chance of recovery if the treatment is given without any delays. I'm scared that I might be forced to stop the treatment and if that happens I'll have no purpose to live." - Kavin Kumar. 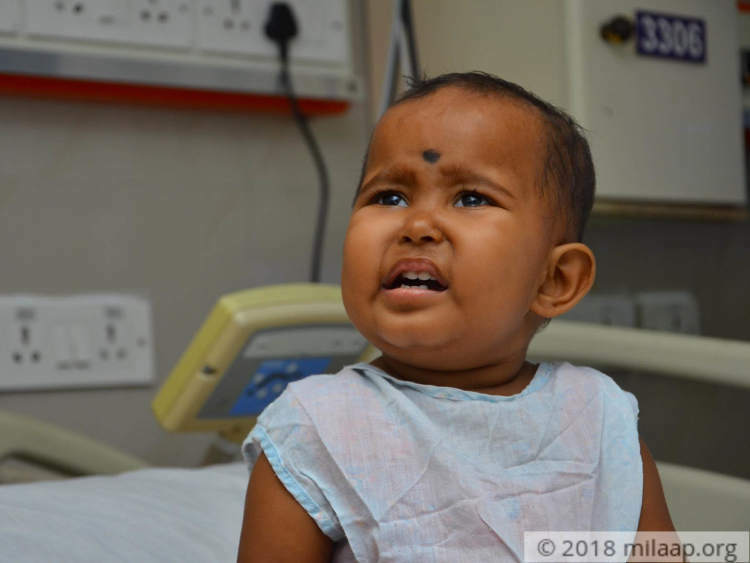 1-year-old Dharshika is in excruciating pain and bleeds profusely from her gums due to dreadful cancer. She needs chemotherapy for the next 3 years. Her parents are desperately trying to save her life. But they have already spent everything they had and now left with nothing to continue the treatment. 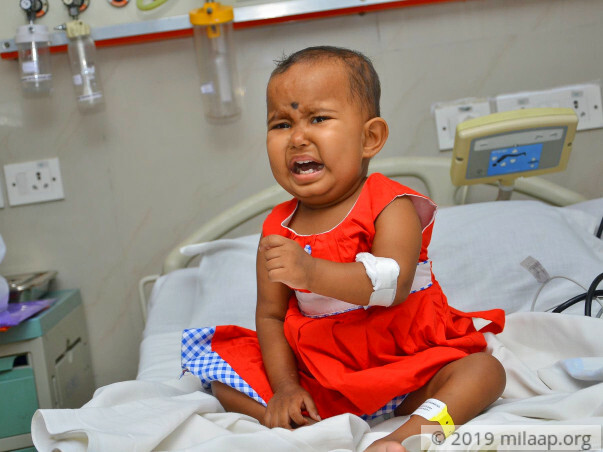 Little Dharshika cannot survive without chemotherapy. Only your support can save her. 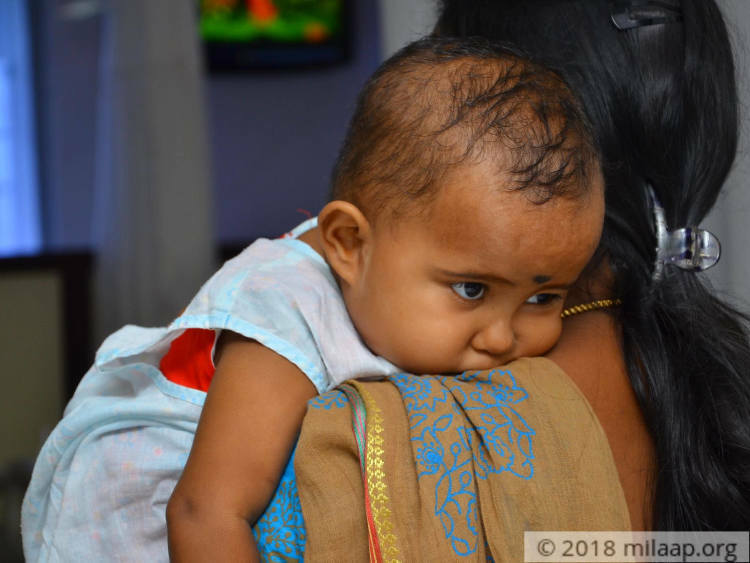 Your kind contribution can save 1-year-old Dharshika's life. Here's an quick update on Dharshika. 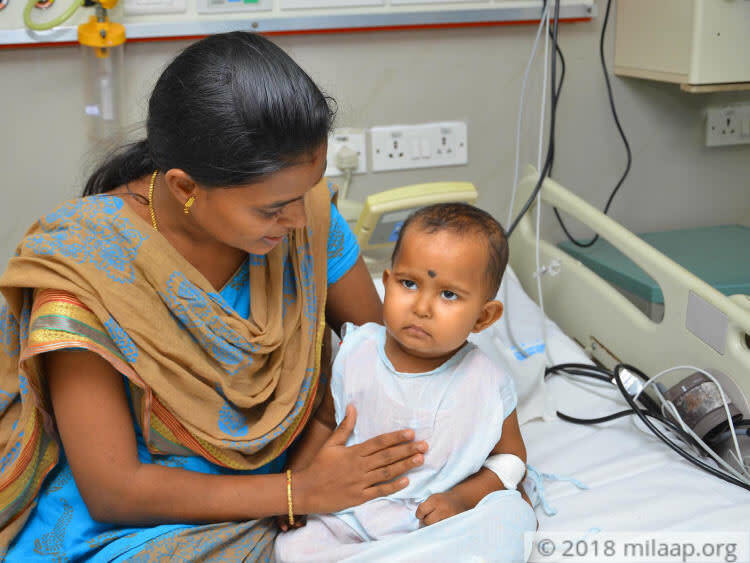 Dharshika is currently at home and is doing good. She is responding to the treatment slowly. She goes for her regular check ups to the hospital. I am overwhelmed by the support you have shown for Dharshika. Presently, she is resting at home. She has revived from H1N1 fever. However, she suffers from hair loss and vomiting as a regular side effect of chemotherapy. The doctors have planned for two more cycles of chemotherapy this month depending on her response. Hopefully, all will go well. Thank you for the love and support. Please continue praying for her! Thank you for all the support you have provided for Dharshika till date. She got infected from H1N1 fever and is presently under medication. Her 3rd cycle of chemotherapy is scheduled on Monday, which is supposed to be a high dose chemotherapy. Please pray for health.